An old building in the historic centre, empty classrooms: a lesson has been interrupted. What had the lesson been about before the light went off, the radio stopped transmitting, the world fell into obscurity? Echoes of violence, of terror; flashes of death and dark forces seem to cross the walls, they talk to each other from one room to another. Welcome to the night of Macbeth! recreating the nightmare imagined by William Shakespeare, in his most dark and violent work. In every workshop we will analyse a fragment of the Shakespearian text that will be staged with the involvement of all the participants, searching for possible meaning within every single scene. 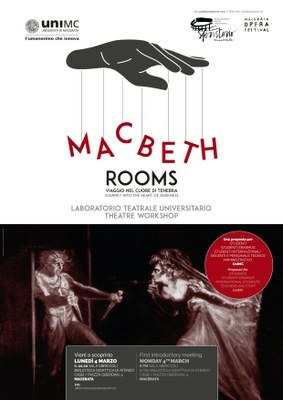 of Macbeth during the Macerata Theatre Festival Utovie, including thematic seminar ideas (literary, psychological, philosophical, political, etc). a real construction site for theatrical creation, where also the common public can be present as listeners. as part of the Macerata Opera Festival, during which the participants will stage Macbeth as a nightmare constructed from mysteriously and “unconsciously” connected fragments.